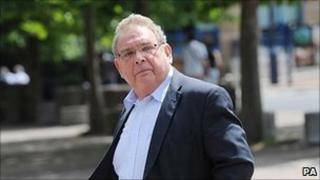 Former Tory peer and Essex Council leader Lord Hanningfield has been jailed for nine months for fiddling his parliamentary expenses. Paul White, 70, was convicted in May of six counts of false accounting relating to nearly £14,000 of claims. He had claimed money for overnight stays in London when he had actually returned home to Essex. Peers, who are not paid a salary, were able to claim up to £174-a-night when attending Parliament if their main home was outside the city. White is the sixth parliamentarian to be jailed for expenses fraud. Tory peer Lord Taylor and four former Labour MPs - Eric Illsley, David Chaytor, Jim Devine and Elliot Morley - were all given prison sentences. Chaytor and Illsley have since been released under the home detention curfew scheme. "As I said in the case of Lord Taylor, the evidence I have heard suggests that the expenses scheme in the Lords was treated more flexibly than in the Commons," he said. But the judge said it was clear that White had claimed for expenses "he did not incur" and his dishonesty had had "serious consequences" for the reputation of Parliament. "He knew when he accepted a peerage that the job of a working peer was unpaid and he did not have to accept the honour," he said. "It is not for me to say whether peers should or should not be paid but whatever you think of the scheme, it was not for any peer to take money to which he was not entitled, on the basis that he believes he is worth it." "Great trust was placed in peers to be honest in their claims for expenses. The public expects no less of them. Lord Hanningfield and others have broken that trust." Lawyers for White said the offences had taken place "in six months of the prosecution's own choosing". "The reality is that this man has actually given his own money for public service for all the 40 years he has been involved in it," said defence counsel Alun Jones QC. White's poor health meant it was "cruel and unjust" to imprison him, he added: "It would only seek to appease a public opinion that has been moulded by the publicity over the past two years." The BBC's Helen Fawkes said the judge had taken White's reportedly fragile mental state and his age into account before handing down the nine-month sentence - the shortest jail term of any resulting from the parliamentary expenses scandal. She said the judge was told that the former peer had been diagnosed with clinical depression and had expressed suicidal ideas at the prospect of being sent to prison. Mr Justice Saunders acknowledged a jail term would be harder for White than "for others who are mentally and physically fitter" but said there had to be consistency in sentencing across different expenses cases.